Note from Crystal: So many of you asked for details on how to grill a pizza on my Hawaiian Pizza Recipe, so my sister — the grilled pizza expert — is sharing her pizza recipe and how to bake pizza on the grill. We love pizza at our house! Over the years, I’ve tried countless different recipes, temperatures, baking methods, and pizza pans. The first time I served grilled pizza, however, my husband took one bite and proclaimed it the best pizza I had ever made. I can’t believe it took me so long to work up the courage to try! I say courage, because for some reason making pizza on the grill just sounded so… intimidating. While it did take a little bit of practice initially to get that “perfect” crispy crust, it was well worth it. And all those visions I had of the dough sticking, melting, and permanently uniting with my grill racks proved completely unfounded. The main difference I’ve found between cooking pizza on the grill versus in your oven is that it cooks much faster on the grill. Everything needs to be ready to go (cheese shredded, vegetables chopped, etc.) before you start cooking the dough. The other thing to remember is that smaller pizzas are much easier to handle. 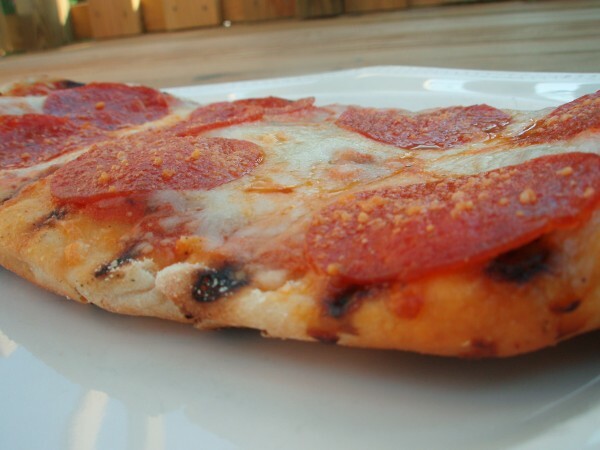 I make individual pizzas (letting each person pick which toppings they want), and this makes transferring the dough to the grill and flipping the pizzas much less complicated. This is my go-to crust recipe for grilled pizza. It happens to be the only one I’ve tried, but I’ve never had a reason to look for another! In a large bowl, combine whole wheat flour, 1 cup bread flour, salt, and yeast. Mix well. Stir in oil and warm water. Continue adding in additional bread flour until the dough forms a ball. Turn onto a floured surface and knead until smooth and elastic (approximately 3-5 minutes), adding in more flour as needed to make a fairly stiff dough. Put in a greased bowl, cover with plastic wrap, and let rise until doubled in size (1-2 hours). Dump dough onto a lightly floured surface and divide into 8 pieces. (At this point, some or all of the dough can be refrigerated or frozen to use at a later time, if desired). Stretch each piece into a rustic 12×4 rectangle (you can also use a rolling pin if you find that works easier) and transfer to a cornmeal-coated baking sheet. *You can use 1 c. bread/all-purpose flour instead of the whole wheat flour. While I love eating healthfully, I am not a fan of whole wheat pizza dough. I’ve found that I don’t mind it at all in this recipe, however. I figure if I can’t tell a difference, I might as well put it in! Pizza Sauce – I use around 3 Tablespoons per individual pizza. Shredded cheese – We like to combine cheeses (cheddar, provolone, mozzarella, etc.) and use at least 1/4 cup per pizza. Turn all burners of a gas/propane grill to high. When grill is preheated, turn down to medium heat (or medium low, depending on how hot your grill gets) and transfer stretched pieces of dough directly onto grill (I just use my hands to do this). I do not oil the grill and have never had problems with the dough sticking. I do four pizzas at a time. Close the lid and cook until bottoms are turning brown, 1-3 minutes. Move them around if necessary to ensure even cooking. Take the crusts off the grill and put them back on the baking sheet, grilled side up (at this point, the dough is cooked so you can use a grill spatula to do this). Spread grilled side with sauce, cheese, toppings, and sprinkle with Parmesan cheese. I sometimes take them inside the house to do this since it’s not as hot as working right next to the grill. Return to grill, close lid, and cook an additional 2-4 minutes, or until turning brown. What is your favorite type of homemade pizza? We grill pizzas on the grill all the time and I even thought about submitting a tutorial as a guest post but I thought no one would want to read it! How funny! My husband has delved so far into the pizza making world that he now grows his own yeast. It’s pretty interesting! we grill pizza all the time and it is seriously the best. Try basil pesto instead of pizza sauce. then put cheese, spinach and tomatos. delicious!! Thanks for the instructions! Would love to try this sometime since pizza is a great summertime food but the oven heat’s not great on the house. We put pizza sauce and toppings onto tortillas and then crisp them on the grill. That’s really good too, if you want a thin-crust style pizza. I’m confused. No pizza pan? Why doesn’t the fresh dough fall through the grill? The grill is hot so it doesn’t. I oil my dough first and it cooks so quick it doesn’t go through the grate. We do this for entertaining all the time. I’ll grill a bunch of doughs on one side before people come. Then I pull out my big wooden cutting boards and bowls with different toppings and let people get creative. When a pizza comes off the grill we slice it small and let everyone taste their creation. At the end of the meal blueberries, peaches, or brown sugar make a sweet dessert with vanilla ice cream. Elizabeth: That’s right – no pizza pan! I was scared to try it at first as well. 🙂 I can’t vouch for every dough recipe, but I know this one works every time for me (some recipes might be “stickier” than others – if it’s not sticking to your fingers when you’re stretching it out, it shouldn’t stick to your grill grates). The dough starts cooking immediately and doesn’t have time to fall through the cracks. We are having grilled pizza tonight for dinner. I really like to make the pizza on the grill the crust comes out so good. We have a wood pellet grill and it adds a nice smoke flavor to the pizza too. 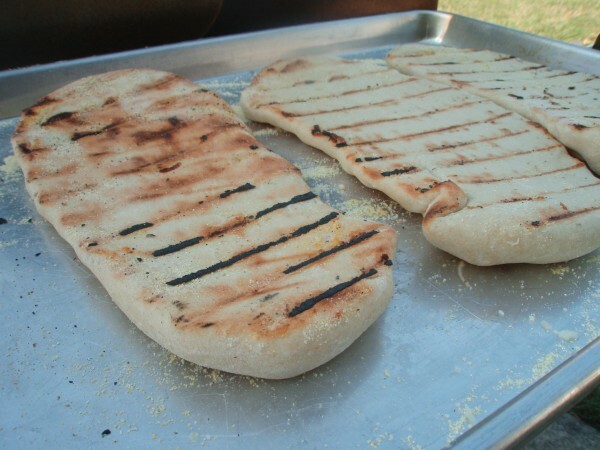 I really like to bake bread on my bbq too when it is hot out. I am out of practice though, the first time I made it this year I ended up burning the bottom of the loaves a little but they were still very good. We usually like to make Turkey pepperoni and olive pizza or mushrooms instead of olives. My kids are allergic to cow’s milk so we use a goat gouda I get at trader joes and it turns out great. Kathy: I wish I knew the answer to this, but I’ve never tried it on a charcoal grill. Has anyone else tried this? I am so excited to try this that I feel a little silly! Thank you so much for the step-by-step instructions! Looks delicious! I make homemade pizza all the time, but we have no grill (we’re apartment-dwellers…no deck). My pizza was transformed when I went from baking it on a cookie sheet to baking it on a pizza stone. SO much better! I just did my first grilled pizza tonight! Turned out great!!! Ellen: Oh good – I’m glad you liked it! When you put it back onto the grill, you put it directly on the grates again, right? It doesn’t specify in your instructions, but it seems right….the photo of the crusts on a baking sheet made me decide to ask and make sure. Thanks! Laura at TenThingsFarm: Yes – you put them directly on the grates again. I just use the baking sheet as a “work surface” when I am putting the sauce and toppings on in between grilling sides. This is such a great idea! Thanks for sharing!! This sounds like a great Friday evening meal! My husband arrives home earlier than me (with the children) but if I’ve prepared the pizza dough (which is happily dairy free … yeah!!) in advance, he should be able to let the children burn off some steam in the back yard while still getting dinner started!! Win, win! PS: Did you know up here in Canada we don’t call it a “grill” … to us it’s a barbeque!! Kimberly: Yes, you can use all purpose flour. Just gave this try and it turned out delish! Thanks for sharing. So I this was my first attempt at making any kind of dough and I ran into a little problem. After the dough rose and I started to separate it into small pieces to be stretched i found the dough to be very elastic. I had a hard time stretching in and ended up only having 4 crusts instead of 8. When they went on the grill the rose even more and bubbled up a bit. We hung in there and kept on going with the toppings and everything tasted great, but we just had really thick crusts. What could I done differently to not have such elastic dough? Thanks for any help! Anyone tried this on a charcoal grill? ?